There is a special place in the mountains, where in September, two species of mountain grouse are next door neighbors. The largest American forest grouse, the dusky grouse (formally known as the blue grouse) and the smallest sharptail grouse subspecies, the Columbia sharptail grouse can both be bagged on the same hike in this magnificent place. Columbia sharptail grouse are a covey bird weighing only a pound and a half – the same size as a ruffed grouse, but only half the size of the dusky grouse. A big male dusky grouse will go over three pounds. Dusky grouse occur throughout the Rocky Mountains, but Columbia shaprtail grouse only occur in certain remote and often difficult to access locals. While other regions of the country struggle to reclaim habitat for the Columbia sharptail grouse, I have discovered a place where this rare game bird is thriving. It just so happens that there are also very strong numbers of dusky grouse here as well. I can’t think of a more productive and beautiful place I’d rather be in September with my spaniels, pursuing the sporting life in the uplands and carrying a double gun. I have coined this place “Mountain Grouse Haven”. In September, when the aspens in the high country are just beginning to blush with autumn, dusky grouse are on the hunt for grasshoppers, fat from summer in the sage and grass meadows at lower elevations on the forest’s edge. Both mountain grouse crave the protein grasshoppers provide. It is here, at this time, that these two very different grouse species cross paths. 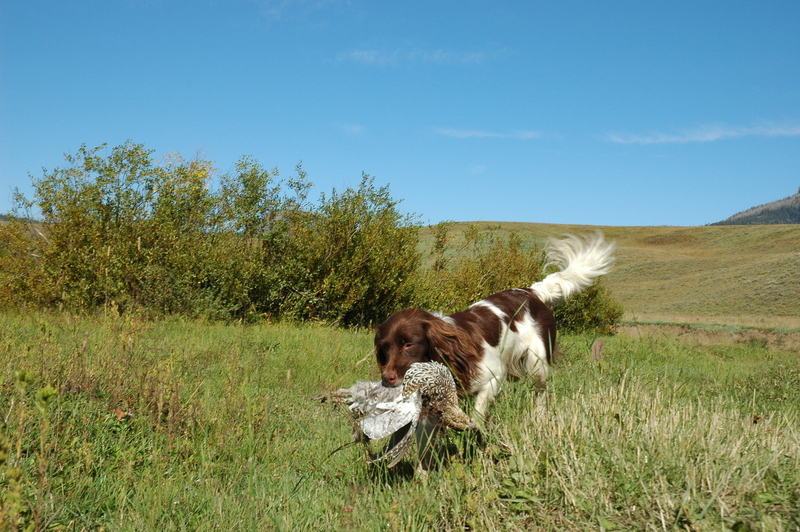 My spaniels have often flushed “duskers” on the edge as we’ve hunted for “mtn. sharpies” out in the open. Last September, I bagged a big dusker two miles from the nearest forest. My pup Izzy, flushed the big grouse out of a small cluster of head high shrubs. With my shot, it disappeared over the hill. It happened so fast, I wasn’t sure if I’d hit it… until it was delivered to hand. Come October, dusky grouse curiously move out of the valley and work their way up to higher elevations as the cold and snow settles into the mountains. They spend their winter days high up on the mountain in the lodge pole pines, eating mostly pine buds. Columbia sharptail grouse stick to habitat in the valleys and only move to lower elevations when drifting snow drives them down. September offers a window of opportunity when these two unique grouse species can be found in close proximity. Another time, just after limiting out on mtn. sharpies, my spaniels flushed a pair of duskers nearby – out in the open grass and sage. In September, the knowledgeable upland hunter has a chance to feel the weight of both mountain grouse species at once, in their game bag. Temperatures can reach up into the seventies at mid-day in the mountains with plenty of blue sky, but at night, it is best to have a warm sleeping bag and a good camp fire. 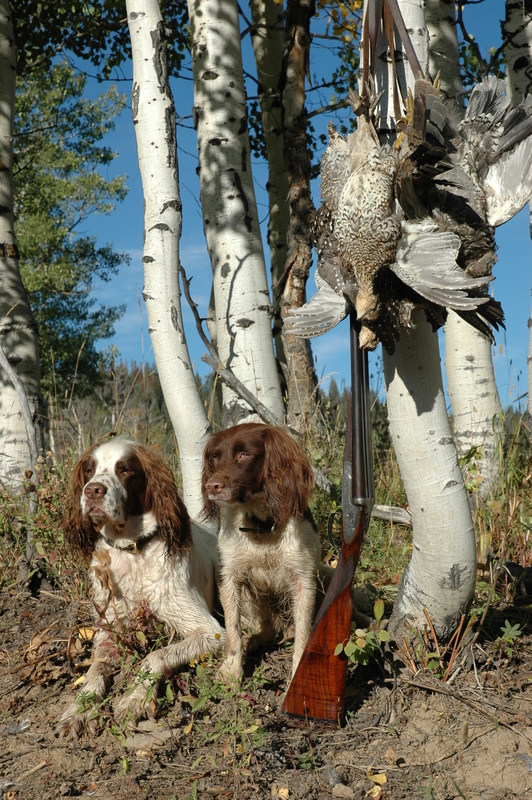 September is the golden month for upland bird hunting in the mountains. The weather is summer-like enough to camp out; the days are still quite long and the air is dry and comfortable. Brief rain showers can move through in late afternoon, providing excellent scenting conditions for the dogs through the following day. Last season, we even had hail one afternoon. As an ominous storm mounted, ashen clouds blackened before our eyes and dumped their frozen contents right onto our camp. The storm left a whitened path in its wake but, it all melted before dark. 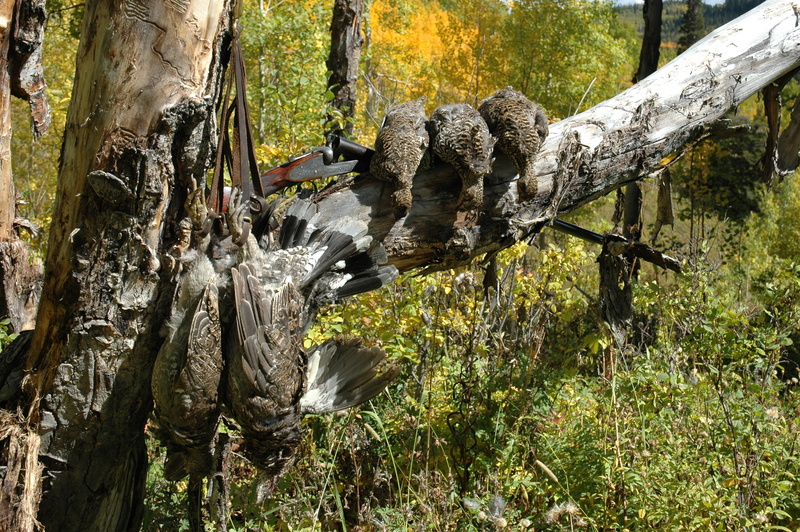 Winter comes early to the high country and in short order, travel to these grouse packed coverts becomes impossible. Hunting in short sleeves during mid-day is common, but long sleeves are necessary in the mornings and evenings. When gun dogs and hunters get overheated out in the open hunting for mtn. sharpies, it is just a short walk to the shade of the aspen and pine forests where the duskers are hanging out. I found some loafing there on one particularly hot afternoon when I was looking to get out of the sun. I hiked up hill through the aspen forest to the edge of the dark pines. Several grouse blasted out unseen, but certainly heard. Then, one bird presented itself and I promptly connected. I was carrying my 20 gauge W. H. Tisdall, a turn of the century Birmingham light weight. Izzy was quick on the retrieve. All the while, a fat dusker stood as a statue on a stump watching. After the delivery, I sent her onto the bird with a hand signal thinking it would be any easy shot. The grouse flushed with a sharp right turn around a thick pine and I discovered that I am not as quick as I used to be. Night time lows in September urge the flowing forth of fall colors, which can quickly transform the landscape. Bright yellow, orange and red catch the sunlight and project a shade of the surreal throughout the forest. The light in the forest was beautiful and unique on one golden day last September. The woods seemed to take on a whole different feel, reflecting rich fall colors into the hunt. Suddenly, Izzy flushed a single dusker heading left through pines and aspens mixed. Crossing through the top of a giant golden aspen, one shot from my newly acquired W. C. Scott side lock dropped the bird in bright forest foliage. My pup was right on it and lugged all three pounds of this mother hen directly back to me. Unknown to either of us, on her way to the retrieve, Izzy passed within yards, up-wind, of two other grouse (juveniles) who were behind a fallen log. It wasn’t until we were on the down-wind side of those grouse that she flushed them both through a five foot hole in dense pines on the ridgeline. While an opportunity to take a double presented itself, I was only quick enough to take the second bird just before it disappeared through the hole. I made a note to self as I watched my pup jump through that same hole – air born for an instant after using the fallen log as a launching pad going full tilt on the retrieve. Holding up that grouse to admire its feathers, I noticed that I was standing in a look- out position with a grand view of the majestic mountain valley below. I felt awestruck by the moment. My friend Richard Jung was there with me. He had traveled all the way from upstate New York for the adventure… well, and to get his daughter situated at DU. I was impressed with his stamina for a retired guy as he was doing well in the altitude… so far. He only had a couple of days to hunt with me, so my aim was to get him into both mountain grouse species. Richard had also planned a return trip a week later when we would have a little more time. We would repeat our adventure at Mountain Grouse Haven plus… add a sage grouse hunt to the itinerary. I had researched a very promising sage grouse area not too far from our camp. I planned to scout there before the sage grouse season opened the following week. Our goal was bagging all three grouse species on the same hunt, which would be amazing. All three grouse were on Richard’s bucket list. I was billing the hunt as the “Colorado Grouse Trifecta”. Unfortunately, this hunt never happened, as several days later Richard tripped down a stairwell while visiting his daughter and messed up his knee. Many weeks later while recovering, Richard mentioned nonchalantly, “There is always next year”. “Indeed there is!” I promised. 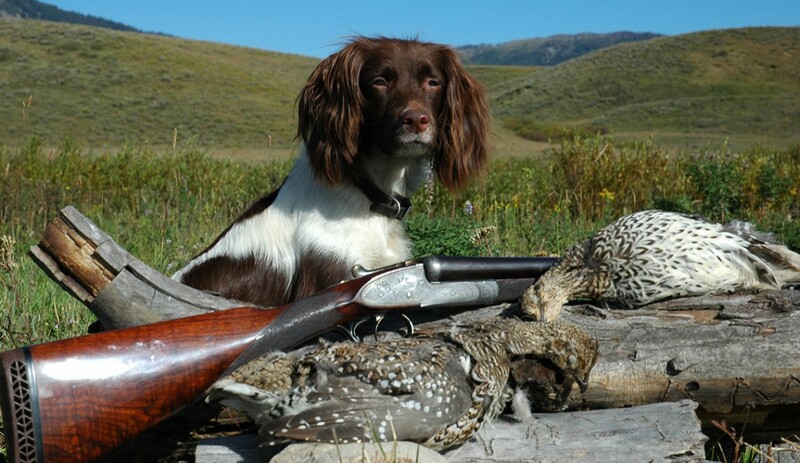 The morning Richard arrived, he didn’t waste any time and promptly bagged his limit of Columbia sharptail grouse, each were taken with just one shot from his recently acquired Damascus W. C. Scott and… over his beloved English springer spaniel, Parker. Both birds were going away singles and both dropped like clockwork, the result of a well-timed instinctive shot. 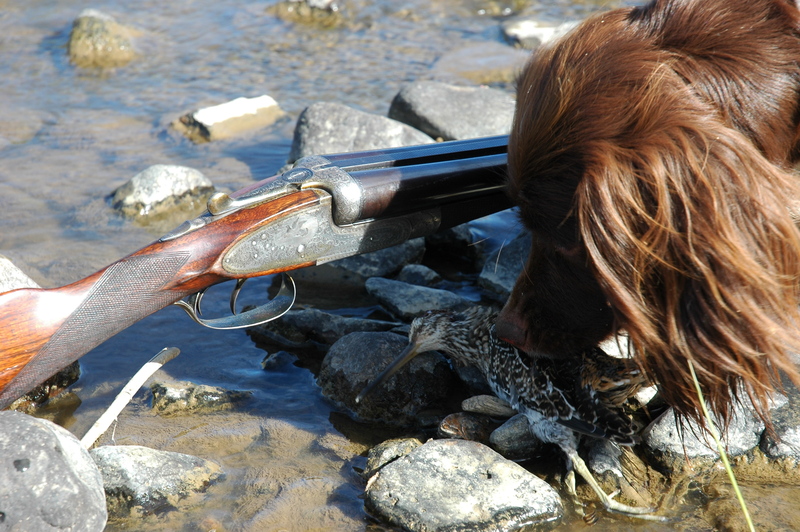 The birds were flushed and retrieved by his well-trained gun dog. It was picture perfect…so far. While they hadn’t yet experienced the rush of a covey rise of mtn. sharpies, Parker had a snoot full of scent from both mountain grouse species and seemed to be quite enjoying herself. At altitude, chasing duskers up and down the mountain, Richard still wore a smile, but then joked about the walk back to the vehicle being a “death march”. I realized that I was pushing too hard, so we simply rested more often. When I began to get an uneasy feeling in the forest and sensed that we are off course, I questioned my instinct, realizing that my reluctance to face the realities of aging played a role in my not owning a GPS. Regardless, this led us into misadventure as we had overshot the vehicle by a few hundred yards. Not all that bad in and of itself, but we had gone far enough for Parker to get tangled up with a monster porcupine – her first. Of course, she attempted to take a chunk out of the slow moving beast and came back with a mouth full of quills. Without a needle nose pillars, we would have missed dinner and been forced into a long trip to see the vet. Parker was such a good girl as I held her and Richard yanked out a couple dozen quills lodged in her lips, nose, tongue and throat. Izzy took it all in. Half-sisters, I joked with Richard, “I hope the porcupine drive came from Parker’s mother”. Parker was greatly relieved to have all those nasty quills removed and was soon acting as if nothing ever happened. Eventually, we found ourselves in the SUV and headed for a new spot. We chose a slight increase in elevation, but still out along the forest transition onto the high prairie where the edge habitat offered a diverse mix of flora and fauna, including several fruit bearing shrubs and… grasshoppers. As luck would have it, we came upon a family group of dusky grouse next to the road and in the open. The nearest trees were over a hundred yards away. Only a small mountain stream lined with seven foot willows supported the grouse for heavy cover. Since I had already taken my share of both mountain grouse for the day, I was able to capture the adventure on digital film. Of course, the grouse flushed as we approached from the vehicle. Parker was up to her nostrils in dusker scent. I was very surprised to watch as these grouse did not fly very far. Perhaps because they were out in the open? When duskers flush in the forest, they fly much further and it is usually downhill. So we pursued, just up the creek and in the open. Richard missed, like all of us do from time to time, humbled by such a big bird flying fast and in the open. Then, our moment arrived, Parker flushed another big grouse from the grass in front of the willows. I say “Our moment” because not only did the dog present an exciting flush, Richard made a great instinctive shot and… I photographed the shot bird in a puff of feathers falling into the top of the willows just out in front of the dog to the right; feathers floating above. I was thrilled for Richard, but this was also a first for me. As an amateur photographer, I had been trying for years to capture an action shot like this. 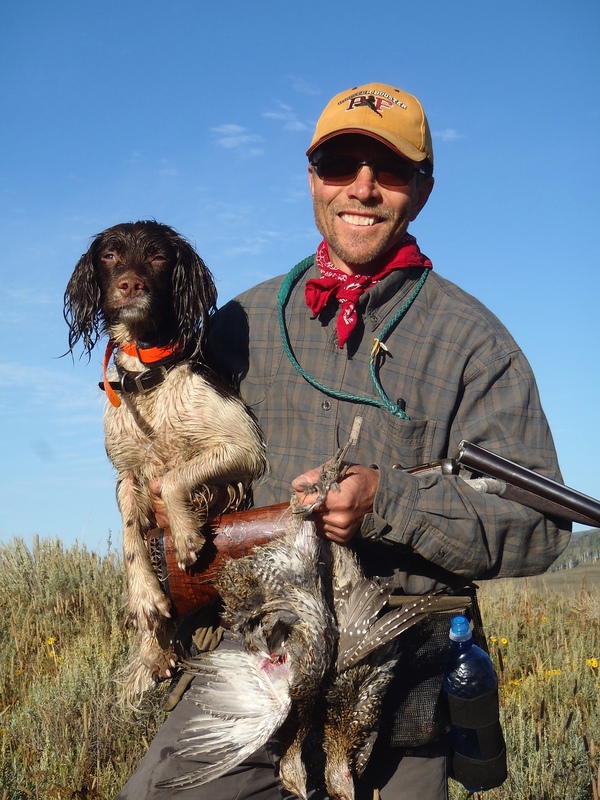 Richard and Parker now had both mountain grouse species in the bag and… on the same day! nt. I found mine on Guns International through seller Charlie Hancock. Richard had been looking for a Damascus double and I had been looking for a side lock with game scene engraving and above average drop. While Richard’s gun is a W. C. Scott production model built in 1900, mine is also a 12 bore, but it is a limited edition, commemorating the competitive pigeon shoots in Monte Carlo back in the roaring twenties. Both coincidentally, have flat file ribs. Richard was shooting RST shells, while I like B&P shot shells – both were 2.5 inch and held #7 shot. 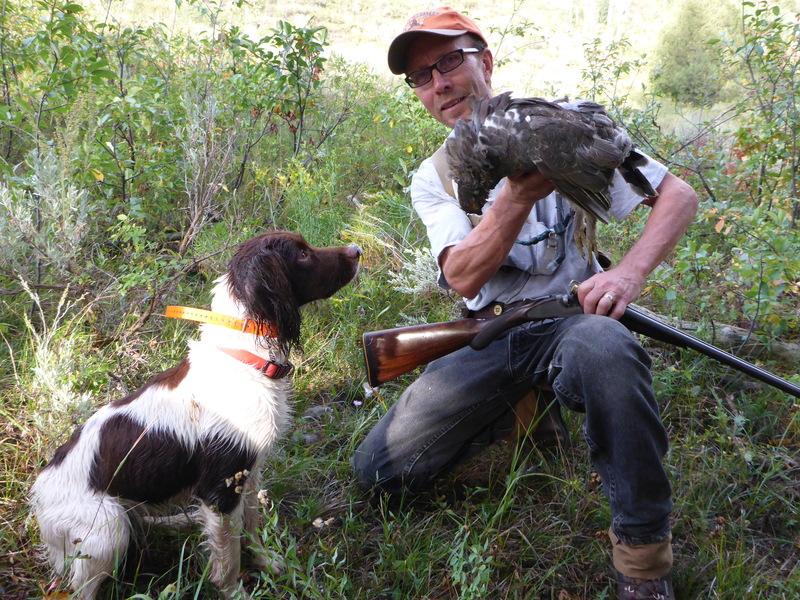 Both guns and loads worked wonderfully on both mountain grouse species. air sacs on its neck, identifying this bird as a male. On the way back to camp, we flushed several other coveys and I knew for sure where to take Richard when he arrived. With each covey rise, these mtn. sharpies staggered themselves – presenting the golden double opportunity at a fast flying little covey bird. Later, I bagged a Wilson’s snipe that flushed up out of the creek bottom willows. It surprised me at first as I never expected to see a snipe at such altitude. I am always amazed with the erratic flight of a snipe. I do not hunt them exclusively and it is only by chance that an opportunity like this presents itself. When Izzy flushed it in the bright sunlight, I knew instantly what it was and didn’t want to blow it for her, as this would be her first snipe. It zigzagged with sharp turns, flying low and back across me to the left. I was lucky to knock it down as I had to wait a bit to allow for a broader shot pattern. It dove into tall, thick grass and apparently dug its way down deep under the grass as it made a last effort to escape. It took some time to find, even some digging, but Izzy finally recovered the tiny bird. “Snipe – an extra bonus to the hunt” I announced, holding it so Izzy could take another good sniff and I could behold its unique plumage. 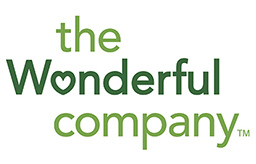 I felt blessed to have had such good fortune and thanked God for this magnificent game bird mecca. When Richard and I finally made it back to camp with all of his grouse, it was dark and there was much to celebrate. 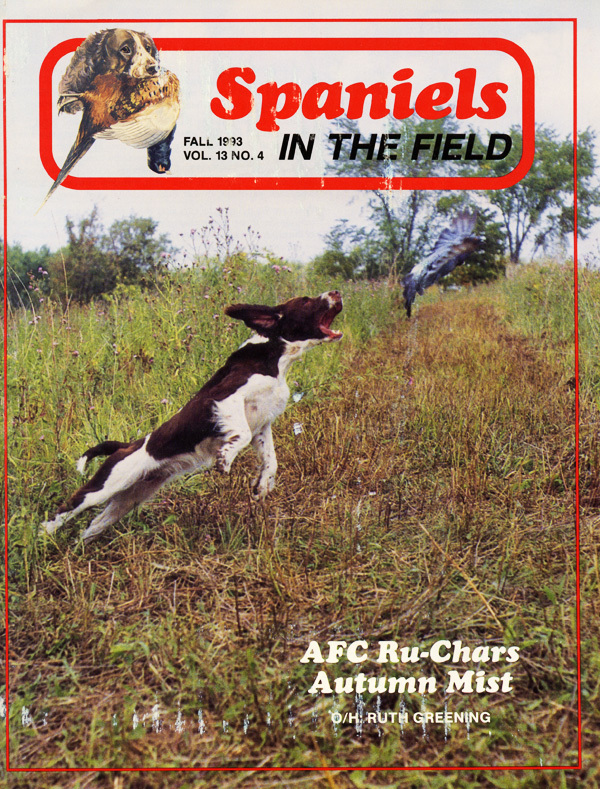 Another friend, Steve Selvig, had come along to hunt with his springer spaniel, Drake. It had only been a few months back when Steve was worried sick about Drake because he had lost an eye to a spur from a wild rooster the previous winter. 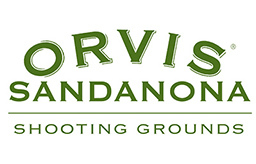 Now, all that worry had been quelled by their success afield hunting at Mountain Grouse Haven. Losing an eye didn’t slow Drake down a bit, in fact, Steve said he didn’t notice much of a difference. They too had taken both mountain grouse species from the day and had a few rich stories to tell. Steve is a great camp cook and he had prepared grouse poppers for us. They were fried up in a wonderful homemade breading, hot and ready as an appetizer… before our steak dinner. Mountain sharptails do not fly long distances like their prairie cousins and consequently, their breast meat is not quite as red. Dusky grouse offer white breast meat, similar to a ruff grouse. The poppers were yummy! 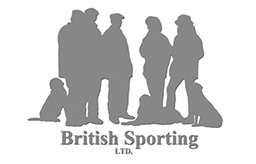 The three of us sat like kings in camp, eating fresh grouse and telling stories of the hunt. We also speculated about the seasonal movements of sharptail grouse, comparing our knowledge on the partial migration patterns of prairie grouse. Richard and I have shared several adventures together hunting prairie chickens and sharptail grouse at Prairie Grouse Haven (DGJ, Vol. 24, #3) in South Dakota on the Rosebud Indian Reservation where I spend October and November. We also wondered why this smallest of the sharptail grouse subspecies had not been classified as a lesser sharptail grouse – much like the greater and lesser prairie chicken? We agreed that the nickname “mtn. sharpie” seemed to fit best. One thing we knew for sure was that these little mountain grouse were pretty incredible and fun covey birds to hunt. As rare and beautiful as they are, we felt fortunate to be able to pursue them in this awesome country with our gun dogs and double guns. It had been a glorious golden day at Mountain Grouse Haven for sure! Gorgeous weather, a magnificent mountain setting, fine double guns, excellent dog work, close camaraderie, delicious food and some decent shooting made for a festive atmosphere in camp. To say that we were on top of the world is not only an understatement, it is a pun. The Milky Way stood out large in the night sky and a million stars shone brightly in our remote location at altitude. Our campfire, warm and inviting, set the stage for the inevitable one-upmanship and of course, the story telling. Laughter echoed out from our camp, penetrating deep into the forest. The only thing that would make the hunt any better at this point was if Richard and Parker could get into a covey of mtn. sharpies the next day. Then, they too would experience this unique game bird’s staggered covey rise. We had the momentum as the final day of our hunt dangled in front of us full of promise. allow me another moment of sleep. It was a damp cold, so we suspected fog and dew or even frost in the valley below where we had planned a combined effort for mtn. sharpies. Gortex was in order, especially for feet. It was an eerie scene as we came upon our hunt area. The creek bottom was cloaked in a thick creamy fog. In places, just the tippy tops of the willow braches poked through. Frost glistened in the new light, up and out of the valley and onto the grass and sage plateaus above. There was some discussion about grouse not wanting to have wet feet or feathers, so we chose an area where the birds could catch the first warm sunbeams of the day. Up we went, onto the same high plateau that had produced a large covey for Steve and I the morning before Richard had arrived. We both limited out there. Steve even bagged a double over Drake with his 20 gauge RBL and was as pleased as can be. So up we hiked to the top and headed for that same spot. That’s when our hunt got even better. We were spread out across the plateau, Richard was working the far side with Parker when the mtn. sharpies began to stagger-flush in succession. I was in the middle and both Richard and Steve shot and dropped birds. I emptied my gun on a long crossing bird flying fast from Steve’s side when of course, Izzy flushed a bunch right in front of me before I could reload. I saw Parker make a long retrieve and Drake was searching for a bird that went down wounded. More grouse flushed and Steve knocked down another. I decided to run over with Izzy and help Drake as Steve was looking for his second bird. The grouse were many and scattered like a broad brush stroke across the high prairie plateau. Izzy and I ended up all the way on the near side where the flat dropped off into the valley. I stood at the top edge and watched my pup flush three more grouse, just down and over the edge. The birds must have been running ahead and popped over the edge to escape. I chose the closest grouse going away to the far left and pulled my full choke trigger – dropping it clean. It tumbled right onto a well-worn game trail down the hill and about sixty yards out. Izzy was making a beeline for the retrieve and headed fast down the trail when, four grouse flushed on my far right, also from just below the top edge, but much closer. I swung my W. C. Scott 180 degrees back around to the far right, reset my footing and connected with my open barrel for the most memorable double! I marked the bird down and then heard shooting from behind me. I turned just in time to see a grouse fall from the sky out in front of Richard and Parker. I also saw grouse in the air and more were flushing up around them. I chuckled to myself as I watched Richard fumbling to reload. By this time, Drake had found Steve’s birds and Izzy was running up the trail with mine. Of course, with all the commotion, I now only had a general idea of where my second bird went down. Izzy completed her retrieve and I tucked that pretty little grouse into my Orvis dove belt. She looked at me with all the excitement I could possibly dream of in a bird dog. I grabbed her collar, kneeled and pointed in the general direction of the blind retrieve and commanded “Dead bird!” Well, as if I hadn’t been blessed enough for one day, she ran right to where I had directed and used her nose to find that bird. She came in with a spring in her step and the most beautiful little package in her mouth. I savored the moment, thanked God and double saved that memory. Richard was still looking for his last bird, so we went to help. We preformed concentric circles out from where he said the bird went down. Parker then flushed the grouse again. While it did appear wounded, it gave Richard a nice crossing shot to finish it and Parker made a great retrieve.